Here is a delicious, healthy and easy to make soup for those cold winter nights! Stay warm and enjoy!! Put a Large Sauce Pan on the stove on Medium Heat, and place the two Bacon Strips on the pan. Cook them on both sides for 2-3 minutes per side, until nice and crispy. Remove the Bacon and set aside for garnish later. (If you would prefer not to use bacon, you can place 2 TBPS of Grass-Fed Butter in the pan instead, and skip right ahead to Step 2 immediately). Put the Diced Onion, Diced Celery, and Pressed Garlic Cloves into the pot and cook for about 10 minutes. Stir the vegetables occasionally, and cook them until the onions start to become translucent. Season the vegetables with the Pink Himalayan Salt and Ground Black Pepper before adding in the next ingredients. Add in the Chopped Broccoli, and Kettle & Fire Chicken Bone Broth, and stir for about 1 minute. Add in the Heavy Whipping Cream and cook for an additional 9 minutes on Medium Heat to allow to simmer. Slowly start adding in the Shredded Cheddar Cheese after the Broccoli has been cooking for 10 minutes. I usually add it in about 1 Cup at a Time, and stir for about 1 minute in between. Continue to simmer the soup for about 10 more minutes. 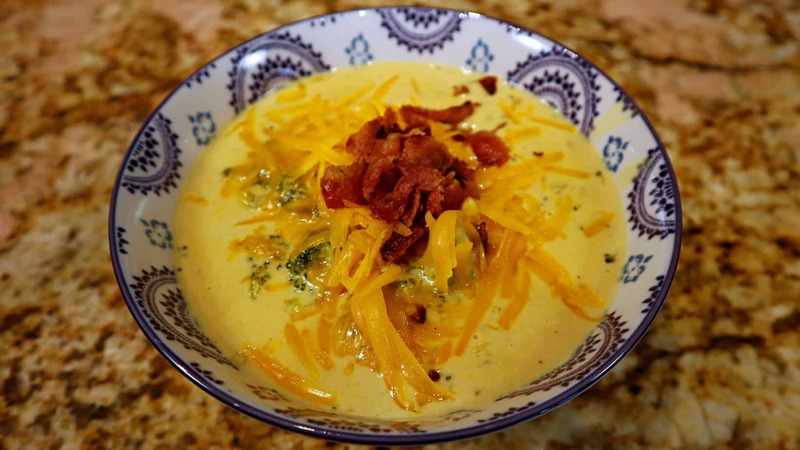 When ready to serve, serve the Keto Broccoli Cheddar Soup hot, and with the optional Garnish of more Shredded Cheddar Cheese and the Crumbled Bacon from earlier. Thank you to Keto Daily for this recipe. Click Here to print.